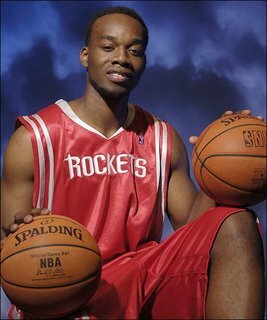 Carl Landry, Houston Rockets – Selected with the first pick of the second round, Landry was a tough bruiser at Purdue who did not project well into a big man’s role in the NBA. However, by proving himself earlier this season in smaller minutes, Landry earned a bulk more playing time with Yao Ming out for the season. He can solidly contribute right now in points, rebounds, and FG%. Recommendation: If you need some big man help and have a bum currently on your roster, make the move right here. Glen “Big Baby” Davis, Boston Celtics – Although Davis has almost no fantasy value, he has turned into a solid player for the Celtics, although I think that anyone playing alongside KG, Paul Pierce, and Ray Allen will succeed simply because no one will be guarding him. Big Baby does not produce a lot of stats but has a lot of presence. Too bad there isn’t a total weight category in fantasy basketball. Recommendation: Funny nickname, thick guy, move on. Marc Gasol, Memphis Grizzlies – I think the only reason he is relevant is that he was part of the trade for his brother. Maybe the Grizzlies got sentimental and decided they needed at least one Gasol on the team. I don’t think the Lakers minded giving him up for the good one. Maybe Marc can develop to be like big bro in the next few years. Recommendation: If your season is lost, pick him up and pretend he is Pau Gasol. Aaron Gray, Chicago Bulls – No I did not just put him on the list because he plays for the Bulls. I think he is something that the Bulls need and lack, a low post presence. Sure he is incredibly unathletic. But earlier this year, he was producing about a point/minute and shooting really well from the field. But it is just like the Bulls to give him some playing time, have him succeed, and then let him sit on the bench. Recommendation: Email Jim Boylan to Free Aaron! D.J. Strawberry, Phoenix Suns – D.J. is the son (get the pun?) of former baseball knucklehead Darryl Strawberry, and he has somehow broken into the Phoenix rotation by offering hustle, defense, and athleticism. But lately, with the acquisition of Shaq and Phoenix floundering a bit, Strawberry has become reacquainted with his spot on the bench. But at least if his NBA career fails, he has a pretty rich daddy. Recommendation: If you are considering him, your season must be done. So as we can see, there are not many gems in the second round. You will occasionally find that solid NBA player and very rarely that star that can make an impact on a team. But mostly, the second round is full of NBDL players whom you’ve probably heard of in college but will never see in basketball again. Let FBP know in the comments above what you think about these prospects. And as always, be sure to sign up for our RSS feed to receive in-depth fantasy basketball analysis.